Recently my Nonnie (Italian for Grandmother) suffered from a broken shoulder after a fall just before her 89th birthday. She was hospitalized and then spent a few weeks in rehab. After she began recovering at home, my mom scheduled a surprise party for her and invited family and friends. After dinner, I asked Nonnie if she was up for a game. I had picked out a game that was easy to learn and understand, and most importantly, easy to play with one hand. Being a good sport, she obliged and played her very first game of Roll For It!. We played as a team for our first game; I helped her with the rules and assisting with reading off card values. The rest was all her, chucking dice and selecting where to play them to score cards. By the second or third game her competitiveness kicked in; she was trash talking my dad, razzing my daughter and having a blast. Then, she ditched me and wanted to play on her own. She was smiling, laughing and really enjoying herself. It made for a memorable day for me personally by allowing me to share my love for gaming with my Nonie. She had been frustrated with her situation and being able to spend time with her family really cheered her up. Roll for It! was the perfect light game for an inexperienced gamer to play and love, especially with one arm still in a sling. Roll For It! 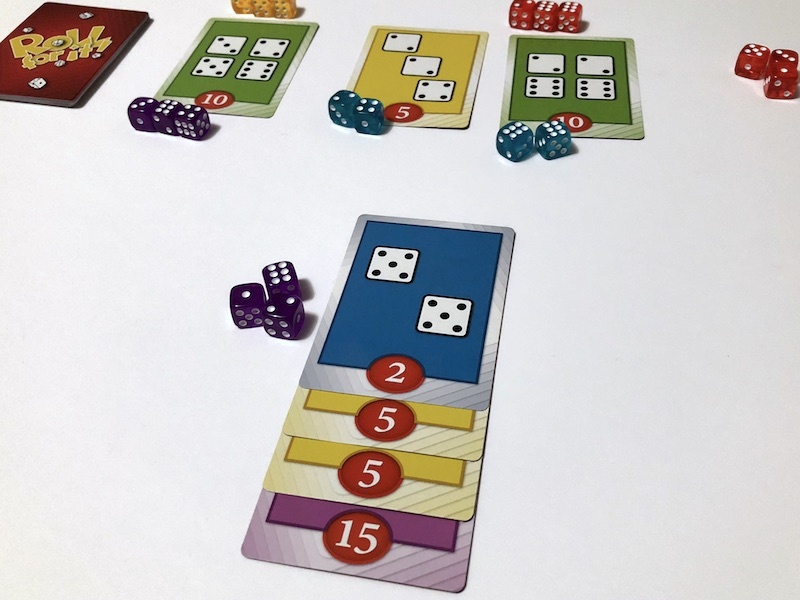 is a simple, easy to teach dice chucking game for two to four where players roll to victory by scoring forty points by matching die rolls to cards. The game is designed by Chris Leder and published by Calliope Games. We talked to Chris about Calliope and one of their upcoming games on episode 81 of The Family Gamers Podcast. Shuffle the deck of Roll for It! cards and place them face down in the center of the table. Deal three cards face up. Each player selects a set of colored dice to use. 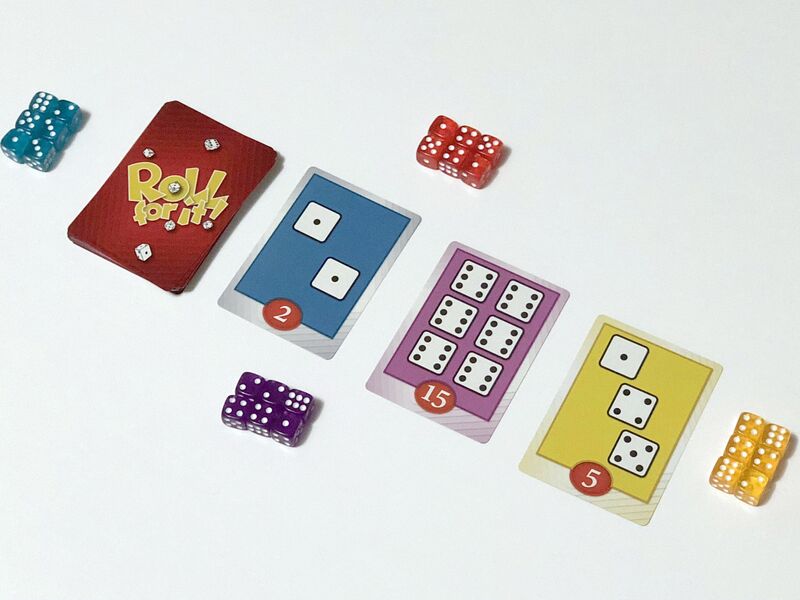 Determine the first player by rolling two dice; the highest combined roll goes first. Points cards come in three different colors and have a difficulty level associated with them. Blue cards are the easiest to match but have the lowest point values (up to four). 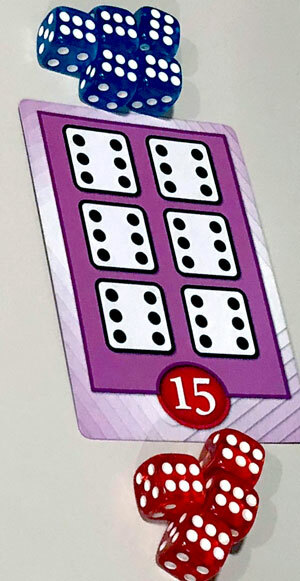 Green cards are medium level with points up to ten, and purple are the most difficult to match but net the highest gain with points up to fifteen. 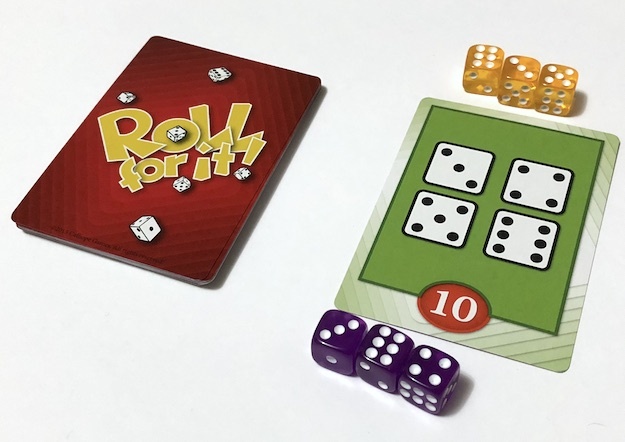 On a player’s turn there are four possible actions: Roll For It!, Match It, Score It and Take Back. The first player starts off by rolling all of the dice (Roll For It!). The individual dice values (pips) can be Matched to die value depicted on a card. When matching, the player takes one or more dice and places them near the card they are working to Score. Matching can take place as long as there are dice to match or the player chooses to stop and pass their turn. Players may also spread dice across multiple cards to increase their Scoring odds. The turn passes to the left when the player chooses to stop Matching dice or no actions are available. Matched dice remain on cards until scored or Taken Back. Take Back is a special rule that a player may use at the start of their turn. It allows them to Take Back all their dice and begin again to Roll For It! with all six dice. Who can get six 6s first? Roll For It! is extremely simple but the randomness of dice rolls can lead to nail biting decisions. Statistically speaking, trying to complete a card with six sixes can be a tough feat versus matching two, three and five. There’s a decent element of risk/reward vying for higher point cards. More often than not, a player will carry on convinced the next roll will be the one. There’s a rush you get rolling that die hoping it’s going to land on the side you need. Will it hit, leading to you bellowing “Oh Yeah!” Kool-Aid Man style, or will you miss, sigh, and pass your turn? I’ve played multiple games where someone was locked up with their dice for six or more turns; especially when stuck rolling a single die. In this situation, other players were able to match cards and climb the point ladder. Things really get exciting when you’re able to match multiple cards on a turn. Racking up a lot of low to medium point cards can help you get ahead quickly. There is no single strategy that will pay off every game, due to the randomness of the cards in play and die rolls. Roll For It! is a fun filler and extremely accessible for non-gamers; bust it out at family gatherings and you’ll be playing in less than two minutes. It’s perfect for pizza night and gaming with your parents or when Grandma visits. Use it to kick off game night or as a pallet cleanser between games. One of the reasons I enjoy Roll For It! so much is that I don’t have to strategize turns ahead and I can enjoy table talk with friends. Combining the Red and Purple editions will add more variety and allow for eight players if you have a bigger group. For these reasons, Roll For It! is already a modern classic and no game library is complete without it.